A blindstitch seam is called ‘blind’ because the needle never penetrates through the neoprene completely, so there are no holes (like a flatlock seam) for water to seep through. Blindstitched wetsuits are often called ‘GBS’ which standas for ‘Glued and Blindstitched’. The ‘GBS’ seam glues the neoprene together and then applies a stitch over the top to lock in the neoprene. This offers greater warmth because it traps the water inside the wetsuit, which warms up against the core body temperature. With this in mind the GBS style wetsuit is better suited for cool to cold-water temperatures. Glued and blindstitched wetsuits are more expensive than flatlock stitch suits for this reason. A blindstitch does not go all the way through the neoprene panel, resulting in a watertight and flexible seam (blindstitch seams are open taped on the inside to reinforce the seam). 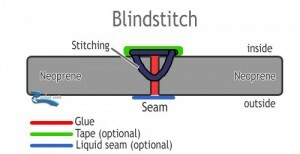 Double blindstitching can be used on thicker wetsuits, where a seam is blindstitched on one side, the again on the reverse side. Once again, there are pros and cons to this approach. This is the ideal seam for cold water and is the one found on higher quality, more expensive wetsuits.